Posted on Wed, Mar 21, 2012 : 5:57 a.m.
Officials are moving forward with plans for a proposed recreation center on Ypsilanti’s Water Street property, but uncertainty over funding has pushed back the construction start date until 2015. That means the project will be delayed at least a year longer than previously anticipated. Coy Vaughn, superintendent of park planning with the Washtenaw County Parks and Recreation Committee, updated city council on the project’s progress at Council’s regular March 20 meeting. "I was under the impression when they started talking about this project that they already had the money and that wasn't a problem, but now it seems they have to bond for some money," Council Member Pete Murdock said. "But if that's what they got to do, than that's what they got to do." "A big part of that is finance and that's the committee that I'm on, so I'll be working to make sure that the financing is there," he said. The sticking point between council and the commission thus far has been the site plan and architecture. Council Members have wanted the center built on the Water Street’s eastside, while commission officials are insisting on the property's northwest parcel. 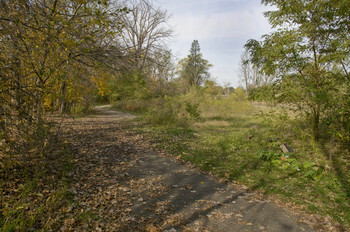 It’s closest to downtown Ypsilanti and lies where the Huron River and Michigan Ave. intersect. Council Members have also wanted a project with a smaller footprint and a more compact, “urban" design. Both parties previously agreed on an 18-month time frame for signing a development agreement, though officials now expect to have that agreement completed by October. The Commission and city is also planning to apply for Michigan Department of Natural Resources Natural Resources Trust Fund grants for $300,000 each year through 2014. The commission would offer matching funds of $292,000 for those grants. The DNR awarded the city and Commission a grant for a $300,000 for a pedestrian bridge that will cross the Huron River in Riverside Park and is part of the Border To Border Trail. Vaughn said the new applications are for outdoor amenities, such as the Border to Border Trail, which will run along the proposed property. Council approved a resolution allowing the city to apply for the grant at the meeting. Sat, Mar 24, 2012 : 1:29 a.m. Sitting around waiting for something better has certainly helped us. Thu, Mar 22, 2012 : 2:39 a.m.
@Concerned Citizen The city is not &quot;giving some land away&quot; The city is giving away 8 to 10 acres of the best commercial real estate on Michigan Avenue and the Huron River. Land the City paid over $800,000 an acre. That means the city taxpayers are on the hook for $6.4 to $8 million for this land give-a-way. If I promise to build a building there by 2015 that won't generate a single penny in property taxes, can I have a couple of acres along Michigan avenue or the River too. Thu, Mar 22, 2012 : 1:20 p.m.
You're making up numbers. How are you defining &quot;paid&quot;? Are you saying the city spent $800,000 per acre of taxpayer money? Or are you saying they purchased 38 acres for over thirty million dollars? Thu, Mar 22, 2012 : 3:24 a.m.
Shhhh, it's going to stimulate business, remember? So we are going to pay millions to &quot;entice&quot; businesses to come in by giving away millions of dollars worth of land? That really sounds like a horrible business plan. Thu, Mar 22, 2012 : 1:25 a.m.
&quot;I was under the impression when they started talking about this project that they already had the money and that wasn't a problem, but now it seems they have to bond for some money,&quot; Council Member Pete Murdock said. Just like Council members are often &quot;under the impression&quot; of something and are mistaken. In the business world, you can't spend millions and millions based on uneducated impressions and keep your job. It seems to be situation normal with city councils. Heifte and A2 city council are &quot;under the impression&quot; that a new multi (multi as in over a hundred) million dollar train station would be great. Or that public art, even at the expense of 3/4 of a million a pop, is important to the city. They're also &quot;under the impression&quot; that expanding bus service and rebuilding/renovating all the AATA stations is worth taxing us more. They don't need justification, see, because there is always that &quot;impression.&quot; These are some of the most expensive, longlasting &quot;impressions&quot; that we'll be paying for for decades. Wed, Mar 21, 2012 : 8:01 p.m. They truly have no idea what they are doing...it's almost would be getting comical if it wasn't so depressing. And I like Harry's idea. Just get the county to help make it into a giant park on the river because no one is going to buy it. Just tax the snot out of residents and at least give them something in return. Wed, Mar 21, 2012 : 5:42 p.m.
City officials just seem to be rearranging the deck chairs. Will the last resident leaving Ypsi please turn out the lights ! Wed, Mar 21, 2012 : 12:30 p.m. The pattern continues. Plans for taxable expansion going to the dogs. It is happening everywhere. Water Street, in the Township businesses rezoned for churches, etc. I actually find this all very sad. Nothing attractive enough here to lure new business interest. YPboyWRheart , The Thompson Building is privately owned. The city has nothing to do with it other than enforcing city codes and ordinances. Harry, Washtenaw County is building the Rec Center, the city is just giving them some land in order to hopefully attract developers to put something on the rest of the land. Please know what you are talking about before spouting off opinions. Wed, Mar 21, 2012 : 11:55 a.m.
Why doesn't Ypsi just turn it into a park. Throw a couple of benches in and a slide and call it a day. I see 7 years from now a new building, no one uses and the city is in more debt than it is now. Wed, Mar 21, 2012 : 11:51 a.m.
Can,t even get the Thompson building finished, how are you going to build a rec center. Wed, Mar 21, 2012 : 12:50 p.m. This goes hand in hand with the Rutherford Pool project. Everything is getting pushed back. Sad to see Ypsilanti wants a rec center and a nice pool for all and someone goes and ruins it. We all need to get it together. Wed, Mar 21, 2012 : 12:02 p.m. The Thompson building is privately owned. It has nothing to do with the city.